New South Wales Health has advised that there is two separate measles outbreaks in Sydney. Two infants, too young to be vaccinated, have been diagnosed with the highly contagious disease. An 8 month old infant, likely caught the infection in the Haymarket area near World Square. Yass Korean BBQ Buffet, 1/39 The Boulevarde, Strathfield on Tuesday 26 March, between 6:30pm and 10:00pm. Time Brasserie (restaurant/café), Shop 11, Level 1 Time Plaza Hurstville 127-137 Forest Rd Hurstville on Wednesday 27 March between 4:00pm and 5:30pm. An 11 month old infant, likely caught the infection in the Eastwood area. Eastwood Plaza 152-160 Rowe St Eastwood, including play areas near Woolworths and on the first floor on Saturday 23 and Sunday 24 of March. Castle Towers, 6-14 Castle St Castle Hill, including play area on the Lower Ground floor on Tuesday 26 and Friday 29 March. The North Village 10-12 Hezlett Rd Kellyville on Wednesday 27, Friday 29 and Saturday 30 March. What to do if you think you or your child has been exposed? Anyone who has spent time in the above locations at the same times should be alert for symptoms, which include fever, sore eyes, a cough, followed by a rash. It can take up to 18 days for symptoms to appear, so stay alert until 18 April. Dr Vicky Sheppeard, Director Communicable Diseases NSW Health, has previously commented on a similar outbreak. She advises that Sydney residents should be aware of the disease’s symptoms and seek medical advice immediately if they believe they could be infected. 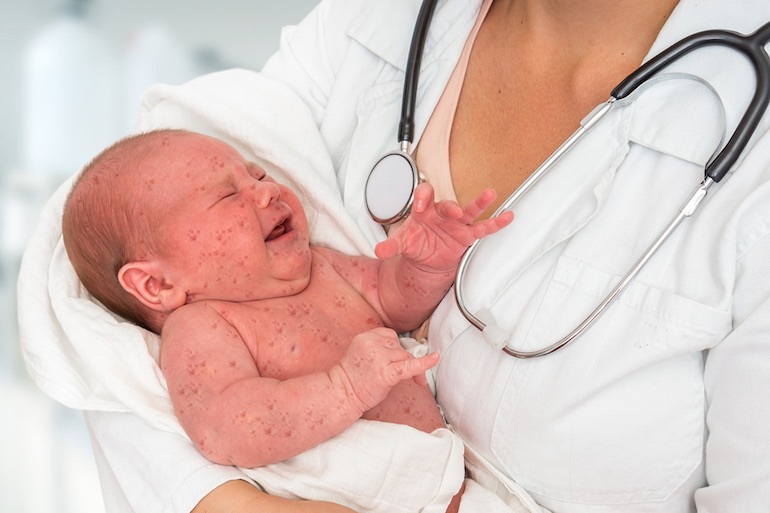 Measles is a viral disease that may have serious complications. In the past, measles infection was very common in childhood. Measles is now rare in NSW because of immunisation but many areas of the world continue to experience outbreaks. In 2008 there were 164,000 deaths worldwide due to measles. The first symptoms are fever, tiredness, cough, runny nose, sore red eyes and feeling unwell. A few days later a rash appears. The rash starts on the face, spreads down to the body and lasts for 4-7 days. The rash is not itchy. 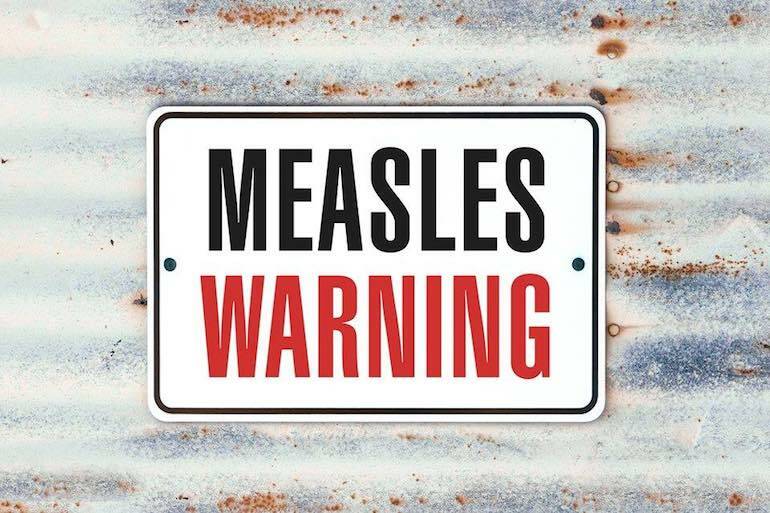 Up to a third of people with measles have complications. These include ear infections, diarrhoea and pneumonia, and may require hospitalisation. About one in every 1000 people with measles develops encephalitis (swelling of the brain). Measles is usually spread when a person breathes in the measles virus that has been coughed or sneezed into the air by an infectious person. Measles is one of the most easily spread of all human infections. Just being in the same room as someone with measles can result in infection. 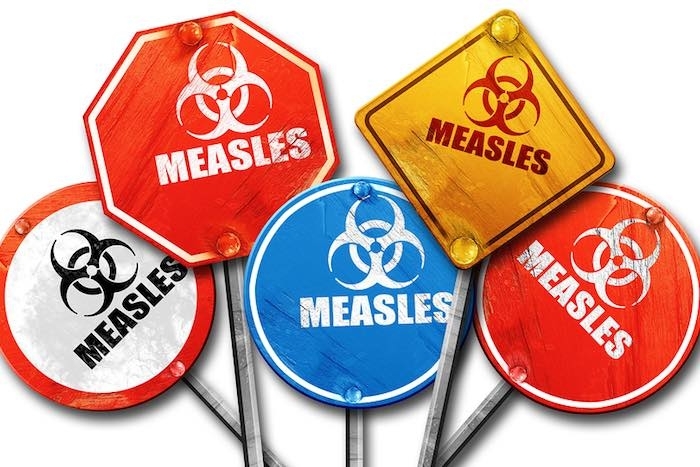 People with measles are usually infectious from just before the symptoms begin until four days after the rash appears. The time from exposure to becoming sick is usually about 10 days. The rash usually appears around 14 days after exposure. For more information you can find the NSW Health Measles Fact Sheet here. PLEASE NOTE: This article is published by Mum Central in the interests of educating readers on the Government’s stance and proposed subsequent actions in this matter. All respectful conversation on social media will not be moderated.